When it comes to wedding planning, we understand each couple's needs are unique. You may enjoy putting every detail into place and just need someone you can trust to be sure your day comes together the way you envisioned. On the other hand, maybe you want a professional with the experience and resources to bring your personality to life in each aspect of your big day. 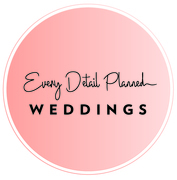 No matter your planning needs, with Every Detail Planned you will feel like you are working with your best friend! We have a variety of planning packages that fit most couples, or we are happy to customize a package to ensure you get all the services you need without paying for those you don't want. We make the effort to understand your exact needs, so the event you imagine is the event you’ll get, personalized and unique to you. We are more than happy to make your dream wedding a reality. The goal is to help you make unique memories that last a lifetime!